$3,000+ directly to teams supporting SC2! By launching this competition, it is the intent of the OSC to provide a medium for teams to compete with one another, in parallel with our $200,000+ SC2 Player Championship. This Team Championship will use player performance in existent OSC Partnered events to provide additional incentives to players, teams, events and sponsors, as well as creating a more involved storyline for the viewer/fans. We are running this Championship through Matcherino, meaning we can utalise crowd funding to increase the prizepool of the tournament! 100+ Teams and Clans competed in events from April-Nov. The top 12 of which qualified for our Finals Playoffs in Feb-March. 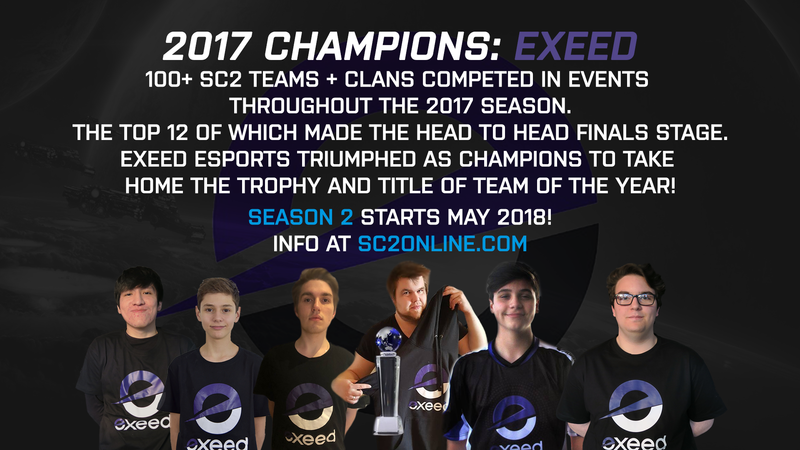 Exeed had an amazing lower bracket run, going all the way to take home the trophy! *These are starting prize pools, which may increase! Likely the same finals format as 2017, combined All Kill into Proleague. To be eligible for Team Season Prizes and Finals Prizes there is a once off registration/admin fee, put back into the prizepool. Email initial squads to OSCSC2@gmail.com or contact Peppy to help facilitate team registration. Team + Clan Live Tracking Website here. 2018 Player Value Live database here. For the purpose of this Championship, we define a team as an established esports organisation (either multi division or sc2 specific), which has sponsors, and supports players with salary, $ incentives, travel support, marketing, or uniforms/gear. Players on the squad can range from professional, semi-pro to ameteur. For the purpose of this Championship, we define a clan as a social group, made up of players of various skill levels, who lack sponsor support, and do not offer salary,$ incentives, travel support, marketing, or uniforms/gear to anyone within the clan. The clan cannot be attached to a team in any capacity. Teams/clans can register as many players as they like. Teams, Clans and Players should notify/contact OSC@gmail.com or OSC Team Championship Project Managers of any roster changes/additions if they want those results added. No partnerships between teams/clans allowed. Academies, Extended Squads, and Community Divisions or other similar programs, will all be counted as part of one unified team for rankings purposes. Teams can add teamless or players from clans to their lists at any time. However If a player leaves between the 1st + 15th of the month, the team they are leaving won’t gain any points from them for that month. If they leave between the 16th-31st, the team can claim the remainder of the month's results, and if the player joins a new team, results can be counted from the beginning of the following month, or at any point within a following month. OSC reserves the right to update or change/edit the Team Championships format, prizepool distribution, rankings formula, or duration at any time throughout it's run in order to improve the design or access to competitors, teams, or larger community. Reminder to use the coupon TC18 to increase the prize pool. FOR FREE! Looks awesome! I used the code to donate to the prizepool. Go PSISTORM! Reduced signup fees have been extended until the end of September. Last chance! 2 months left in the season part of competition! Quite a few teams basically tied on points, going to be a tight run home! Hello, how to signup and when is signup starting?